You've chosen the perfect location for your group event. Whether you are celebrating a family reunion, a corporate meeting, a formal sit-down dinner, a rehearsal dinner or your wedding day we can assist you. We have successfully planned over one-hundred events at Keystone Resort and know how to get things done at the very lowest prices. We can accommodate just about any budget, too. We offer several outdoor venues located within the Keystone Ski Area boundaries that can be custom tailored to your desires. For group services, discounts and packages call 888-295-2468 for your own planning consultant. The Keystone Conference Center offers a spectacular setting for any meeting, conference or event. With more than 95,000 square feet of meeting, exhibit and function space throughout Keystone, the resort can handle groups up to 1,995 people. 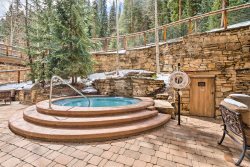 If you select Keystone for your wedding celebration, Gondola Resorts will organize vacation rental homes or condos for your entire party. The entire wedding party receives discounted rates on lodging at the resort. Reservations can easily be coordinated through our office. Additionally, the Bride and Groom will receive a credit off the nightly rate for every lodging reservation booked under the wedding party.